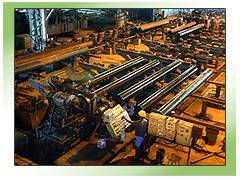 The pipe mill at Line Pipe Division is equipped with plant and machinery of emerging technology to meet customer's requirements in Hydro-carbon sector besides power plant and water transmission lines. Some of the advance machineries like Spiral Coil Accumulator with Shear End Welder, Edge Milling up to 15mm, either edge, Solid State High Frequency Welding of 1000KW with 3 sets of 1500KW Seam Annealer, etc, are of latest design. The well equipped online test facilities like Hydro Test, Seam HAZ, Full Body UT and Pipe END MPI, etc are available to meet client requirements of HFW Pipes in API 5L, ASTM and equivalent Hydro-carbon Line Pipe standards. For high pressure line pipes to be effective, the pipe needs to be with minimum variation in material properties and dimension, particularly its thickness and shape. These are best achieved in HFW Pipe produced from Hot Rolled Coils with solid state welding where the strip edges are forced together by weld roll. 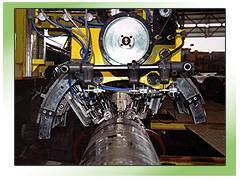 The molten iron is forced out of the joint along with the scale that has formed. The liquid iron and iron oxide prevents oxygen from combining with iron deeper into the edges, thus forming the metallurgical bond that is as strong as the parent metal. Fortunately, in our Forge Weld technique, the wall thickness in the weld area is increased marginally that makes the bonding line strong.